Homepage photo: The lit neon lights of the park's entrance sign at sunset. Fun is where you find it. 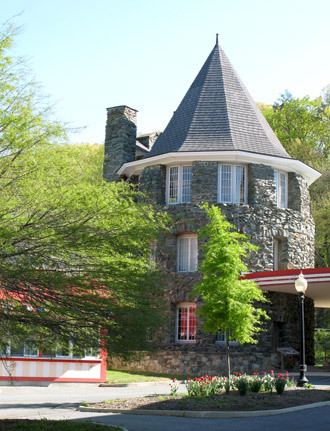 Just minutes from downtown Washington, DC, Glen Echo Park has been a center of American entertainment and leisure for more than a century, and continues to serve as an arts and culture venue for children and adults. A visit to Glen Echo Park is truly a unique experience. Approaching the entrance, you'll find your first must see site — the ruins of Edward and Edwin Baltzley's 6,000 person amphitheater, built of locally quarried stone for the first and only Chautauqua season in 1891. Chautauqua was an adult education movement popular in the United States during the late 19th and early 20th centuries. The massive stage hosted such luminaries as Samuel Clemens (better known as Mark Twain), Clara Barton, and John Philip Sousa. Later, the amphitheater served as a popular fun house until termite damage forced its destruction in 1959. If you listen closely, though, you might just hear Sousa's march, “Washington Post” echoing forth from the ruins. To enter the park from the main parking lot, you'll cross the Minnehaha Creek, which drains into the Potomac River. While you might not think of Glen Echo Park as an environmental preserve, the park is an integral part of the Potomac Gorge's fragile ecology. You'll often find rangers and dedicated volunteers throughout the park replacing non-native and invasive species with indigenous plants, shrubs, and trees to preserve this incredible ecosystem in the backyard of the nation's capital. In the hustle and bustle at the park's center, you'll find yourself surrounded by numerous arts and culture activities, such as glass blowing and pottery throwing. The numerous artists, studios, and classes that make up this vibrant scene are organized by the non-profit Glen Echo Park Partnership for Arts and Culture. In summer, the center of the park is completely dominated by the whirl of colors and percussive notes of the 1921 Dentzel Carousel and 1926 Wurlitzer Band Organ. Entertaining as it may be, the carousel also serves as a reminder that the amusement park at Glen Echo once was racially segregated. On June 30, 1960, the carousel was the center of engagement for Civil Rights protestors demanding integration at the park. Although they were escorted from the park that night, protestors were successful in ensuring that the park was open to all races in 1961. When the sun sets at Glen Echo Park, the dramatically changing light is a photographer's delight, and the park's Art Deco-themed neon signs reflect the heyday of the amusement park era. By the neon glow, navigate your way to the Spanish Ballroom, where every Friday, Saturday, and Sunday you can dance to a variety of live bands. From mid-June through August, be sure to take advantage of the concerts every other Thursday evening. 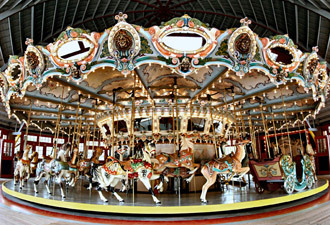 The 2012 summer season gets underway on Family Day, Saturday, April 28, when the carousel and the band organ reopen. Rangers offer a variety of programs throughout the summer, such as the morning bird watch, the invading suburban backyards program, and Glen Echo Park and carousel tours. 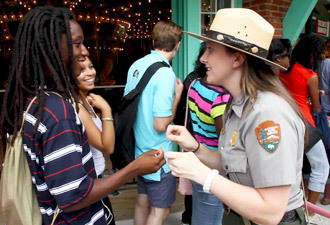 Exciting activities are on tap for kids who participate in the Junior Ranger Program. Be sure to check the Glen Echo Park Partnership for Arts and Cultures website for additional programs, courses, dances, and concert series.